Tony Iommi is, without doubt, one of the most influential guitarists in heavy metal. Throughout his career, memorable and classic riffs have poured out of him - where would the world of rock be without classics such as Paranoid, Black Sabbath, War Pigs, Heaven And Hell, Sweet Leaf, Children Of The Sea, Symptom Of The Universe, Iron Man and the many others he has written? To some, his song- and riff-writing falls into the ‘anyone could have written that' category, but the reality is there is a real skill and art involved in coming up with catchy and memorable musical ideas. In other words, there is a lot to be learned from Iommi. Let's take a look at the examples that feature in the following audio and video demos. Whereas it might be tempting to think of this material as being quite straightforward, it's the feel of these ideas that you need to take time to master! This section is a very typical ‘pseudo classical’ picking phrase, in which clean chordal arpeggios are interspersed with simple high E string melody notes and short bass note lead-ins’. Technically, it’s pretty easy to play and will suit pick, fingerstyle or even hybrid picking. Just play it in time, taking care to observe the syncopated/ accented melody notes (>), and all should be okay with the appropriate amount of practice. Adding a touch of reverb and chorus would also be appropriate during this section. Similar intros to this can be heard in Black Sabbath songs such as Children Of The Sea and Sign Of The Southern Cross. This section contains some typical heavy riff ideas. Here I show the chords played in more than one location. Realistically, if you were to play something like this in a song, you would probably stay in one area. For instance, you could use E rooted powerchords for a little longer and then, on later repeats, perhaps change to another type, such as the open chords or the low E and A string diads. I’ve shown a few different options in the space available. It’s up to you to find out what you prefer and come up with a part that works for you. Tony consistently does a few things with his riffs, including using E rooted powerchords such as G at the 15th fret, as opposed to the same chord played as an A shape at the 10th fret. Chromatic movement also abounds in his writing. The G-F#-F seen in the second bar of the riff section here is typical. The main riff in Sabbath’s War Pigs offers a good reference for this idea. Tony is a real master at leaving space for his ideas to breathe - he often cuts chords short in order for this to occur. Finally, he is brilliant at playing in time at really slow tempos - the extremely slow three-note main riff of the song Black Sabbath is a prime example of this. The secret to playing effectively at these slow speeds is to subdivide the underlying pulse with much smaller rhythmic units silently in your head. For instance, it’s a lot more accurate (and less risky) to count in 16th notes (or possibly even 32nd notes) than quarter notes at slow speeds - try it and see for yourself! 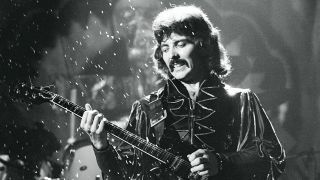 Iommi often includes riff sections that go from chordal ideas to single-note riffs or vice versa. It is also routine in this style to incorporate a musical break that then goes into a contrasting new riff played at a different and often faster tempo. It’s a great device for generating excitement by kicking everything up a gear. In my example, the last chord of the heavy riff section is held and the speedier tempo of 128bpm (up from 118bpm) is introduced by the new single-note riff. This riff then continues until the end of the track, acting as a solo backing played by the bass guitar. Note how, in my riff, the ‘devil’s interval’ (ie, the ^5 note of Bi,) has typically been featured as an accented note. Also, the D5 - D5/C# - D5/B - D5/A progression can be played as written, or you could just sustain or hold a root/5th diad D5 chord and let the bass do the work. On the demo I play it both ways, letting the bass take over the line and not always doubling it on guitar. Listen to the song Neon Knights to hear exactly what I mean. The eight-bar solo section kicks off in bars 27 to 34 with a few ascending unison bend ideas. These are a pretty common feature of Iommi’s lead style and work well in a three-piece band setting (like Black Sabbath) because they fill everything out nicely. As you play these, try to aim for a fairly fast vibrato that doesn’t go sharp in pitch, and you will be in the right ballpark. You might notice I use my fretting-hand first and second fingers for these bends. Bear in mind, a lot of players tend to use their first and third fingers instead. I think it’s fair to say a lot of licks found in Iommi’s lead style have become rock clichés. But they weren’t clichés when he started using them! To my mind, he was an originator, as well as an adopter of early blues/rock ’n’ roll licks and, like many other players, took them to a whole new place.